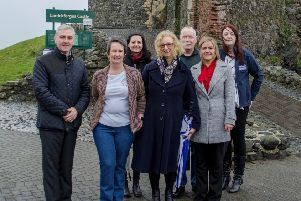 Style conscious residents of Whitehead are in for a treat after plans for the town’s first ever Fashion Week were revealed. Due to take place this autumn, the event will build on the success of a recent fund-raising ‘Celtic Diva’ fashion show in the town. The St Patrick’s Day show in Brown Memorial Hall generated over £500 for Hope House and Whitehead Storehouse. Organising Whitehead’s debut fashion event is Angela Turkington, owner of The Front Room boutique on Edward Road. “The fashion week will take place in September and it will hopefully involve lots of local designers; there will be lots of fun events to raise money for local charities,” said Angela. Along with bringing the well-known fashion week glamour to an alternative seaside setting , Angela also hopes to showcase a new range of fashions for curvier women. “One of the things I hear from some of my customers who are curvier ladies is how difficult it is to find fashionable clothing that fits,” she said. A designer, Angela opened The Front Room boutique in the former bank building complex on Edward Road earlier this year. “We stock a range of retro and vintage as well as brand new fashion and local designers,” she said. “We also have bespoke fascinators and millinery. The Fashion Week programme will include shows, sewing classes and other events yet to be finalised.